Barbara Ellen Sorensen’s Compositions of the Dead Playing Flutes embraces the many joys of spirit and flesh, while acknowledging that death is an ever-present shadow. Her lyrics sometime sear, sometime soar, and are rooted in nature and her lived environment—arroyos, tundra, riparian forests—and further abroad in Haiti and Milan. These poems sing of the body both beauteous and bountiful, and contrapuntally lament trials of illness and surgery. The spirit of her lost son pervades her musings. Incantatory and mystical, she offers us “bells and charms/ that only girls can cast out like handfuls of sugar/ across any universe,/ any threshold.” This collection richly rewards its reader. Its release is an event to celebrate. 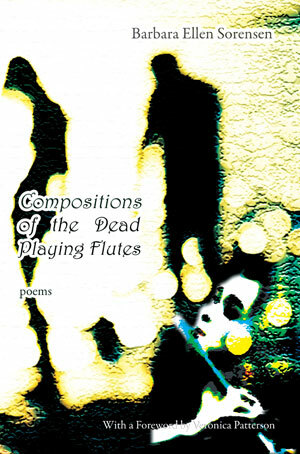 Barbara Ellen Sorensen’s Compositions of the Dead Playing Flutes is a book of stunning wakefulness. For it is a wake, but at the same time a celebration, one that focuses on places where the dead were once most alive, places where we are most acutely seen and heard. Here they are deserts, seascapes, landscapes with families. Like the bird wings that so often lift this stunning debut, Sorensen’s flight is full of gravity: “One day you are as light/ as a bird, and then/ you are not.” We stay aloft by living, by insisting on the protean body of the world. Sorensen’s gift is elegy’s clear song, how it may conjure grace from serious illness, car crash, the loss of a child. “The universe bears no flatness. Even its horizon is curved toward repetition. Your death is a horizon. I run to slip over its edge.” Yet we don’t, we stay. By honoring, each to each, our essential complexity, Sorensen reminds us love’s true service is survival. These poems are attentive, scrupulous, and transforming, as they range from the sensuous to the spiritual . . . Opened in body and spirit, the poet embraces her worlds, and she offers back this poetry, which shimmers in its urgent, delicate balance. Barbara Ellen Sorensen is a lyric poet in the sense that any fabulist might be called lyric—a modern Ovid offering metamorphoses of the triumphs and ashes of human existence in a voice at once deeply personal and entirely of us all. Mystic, mythographer, trickster and elegiast, Sorensen engages subjects that would be ashes in the mouth of a lesser poet—relief work in Haiti, brain surgery, and most devastatingly, the death of a son—with Orphic transformation and the deep truth of stories we tell ourselves by the fire to keep ourselves alive. From the formal mastery of poems like “My Lithium, My Heart” to the exquisite free verse of “Doubting Cremation” (“the beauty of a body/ torn twice from mine, because all mothers/ repeat the births of children who die”), Sorensen gives us, in her Compositions of the Dead Playing Flutes, the record of her epic travels, her trips to the underworld, and along with that, the words that will save us. Sorensen’s chapbook, Song from the Deep Middle Brain (Mainstreet Rag, 2010), was a Colorado Book Award finalist. She was nominated for a Pushcart Prize for her memoir piece, Ghostflower & Wind(Drunken Boat, 2012). An interview with her can be found in Fringe magazine (spring, 2012). Her undergraduate degree in English is from the University of Iowa; her graduate degree in creative writing is from Regis University.